Dorothy Humel Hovorka has been many things: dancer, concert pianist, business owner, fundraiser, philanthropist. And in a ceremony on January 8, she acquired one more distinction: she became a graduate of Case Western Reserve University. Mrs. Hovorka is one of this year's recipients of an honorary doctorate of humane letters. "An honorary degree recognizes excellence in aspects of human endeavor, among them scholarship, public service and the performing arts," said College of Arts and Sciences Dean Cyrus C. Taylor at the conferral. It is the university's way "of expressing admiration and appreciation to those individuals who have exemplified the highest ideals and standards of conduct." In Mrs. Hovorka's case, the degree pays tribute to a woman who has worked tirelessly to support education and the arts in Cleveland. Born January 4, 1921, to self-educated Czech immigrants, Mrs. Hovorka studied ballet as a girl and attended Shaker Heights schools, skipping three grades and taking college-level courses in high school. Yet a degenerative eye condition prevented her from actually attending a college or university. Fortunately, the problem was later corrected and Mrs. Hovorka did not lose her sight. But her friends say it was always a source of regret to her that she wasn't able to continue her education. "She's absolutely thrilled to receive the honorary degree," says Nancy Kurfess Johnson (FSM '48, School of Medicine '54 [M.D.] and '98 [M.S. ]), who still remembers Mrs. Hovorka's response when the university asked her to join the board of trustees in 1977. "She said, 'Well, I can't do that. I never went to college.'" Despite her initial hesitation, Mrs. Hovorka served on the board for nearly two decades and continues to provide leadership as a trustee emerita and an honorary trustee. In addition to studying ballet in her youth, Mrs. Hovorka achieved recognition as a classical piano prodigy. Beginning in 1949, she performed six times as a soloist with The Cleveland Orchestra; for her final concert in 1959, the guest conductor was Arthur Fiedler of the Boston Pops. Soon afterward, Mrs. Hovorka abandoned her musical career to concentrate on fundraising for the orchestra. "I gave up performing because it's a very selfish life," she told Shaker Life magazine in 2006. "You have to spend so much time practicing if you're going to be outstanding." Mrs. Hovorka became secretary, treasurer and then director of her family's construction company, all the while maintaining a full schedule of civic pursuits. She served as a board member, and in some cases as president, of several cultural organizations, including University Circle, Inc., the Cleveland Music School Settlement, the Musical Arts Association (the parent organization of The Cleveland Orchestra), the Cleveland Summer Arts Festival, the Lake Erie Opera Theater, the Cleveland Women's Orchestra, the Cleveland Institute of Music, the Robert Casadesus International Piano Competition and the Women's City Club Foundation. For the university, Mrs. Hovorka has devoted her time and energy to countless committees and councils. In 1987, she chaired the Michelson-Morley Centennial Celebration, a six-month festival of events that included lectures by 17 Nobel laureates and the installation of a light sculpture that continues to shine from the roof of Crawford Hall. 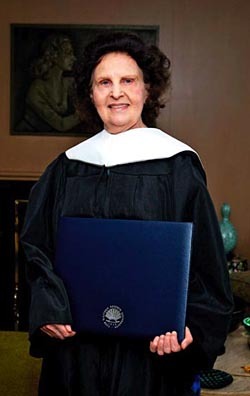 In that year, and again in 2000, Case Western Reserve presented Mrs. Hovorka with its highest honor, the University Medal. In addition to leading major fundraising campaigns for the university and the College of Arts and Sciences, Mrs. Hovorka has been boundlessly generous in her own right, creating four endowment funds with gifts totaling more than $2.5 million. 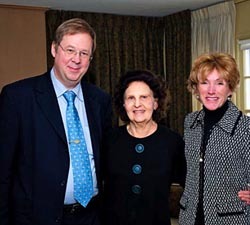 Much of her philanthropy has been in loving memory of her late husband, Frank Hovorka, the Hurlbut Professor Emeritus of the Department of Chemistry. "Between the two of them," Johnson says, "their passion was the university and The Cleveland Orchestra." The couple married in 1982, and celebrated their first anniversary by visiting Professor Hovorka's birthplace in Cernikovice, Czechoslovakia. After hearing solo violin and flute performances by students at her husband's old elementary school, Mrs. Hovorka presented the school with a set of Cleveland Orchestra recordings. Professor Hovorka died in 1986. Since then, says chemistry department chair Mary Barkley, Mrs. Hovorka has provided support for "things that he would be interested in and care about. She really has been the patron saint of this department." University President Barbara R. Snyder joined Dean Taylor at Mrs. Hovorka's home to present her with the honorary degree. "Dorothy Humel Hovorka, you have lived your life in service to others," said President Snyder. "You recognize how important the arts and education are to the well-being of a community and its residents, and have spent decades ensuring their health and vitality in Cleveland. Your efforts have transformed lives, and will continue to do so for generations to come."